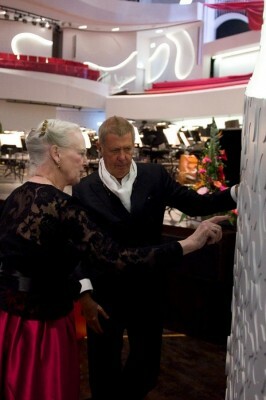 This Danish multifunctional complex was opened on March 29, 2014. 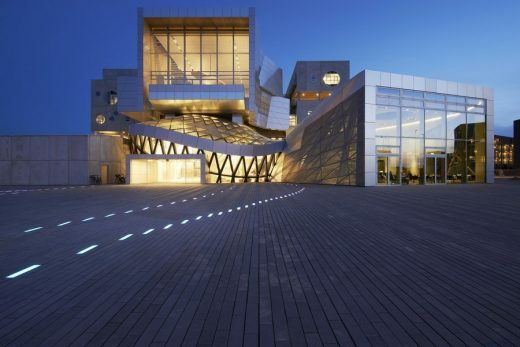 After four years of construction, the “House of Music” in Aalborg, Denmark was ceremoniously opened on March 29, 2014 by the Danish Queen Margrethe II. 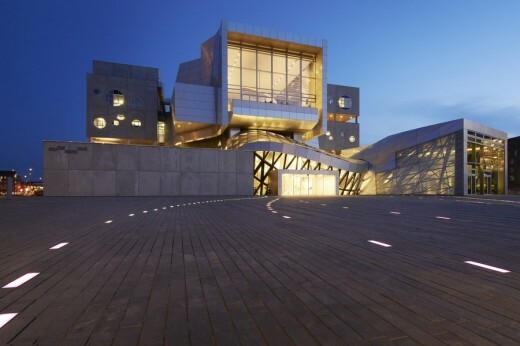 This cultural centre was designed by the Viennese architectural studio Coop Himmelb(l)au as a combined school and concert hall: its open structure promotes the exchange between the audience and artists, and the students and teachers. 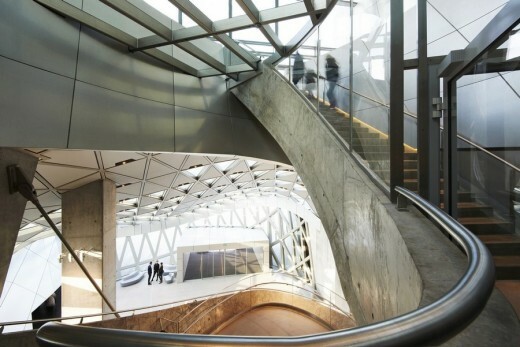 “The idea behind the building can already be read from the outer shape. 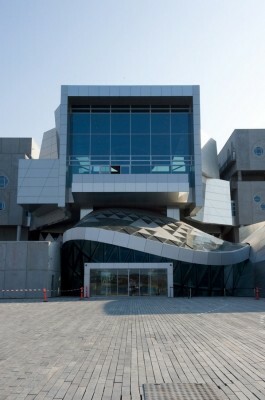 The school embraces the concert hall,” explained Wolf D. Prix, design principal and CEO of Coop Himmelb(l)au. 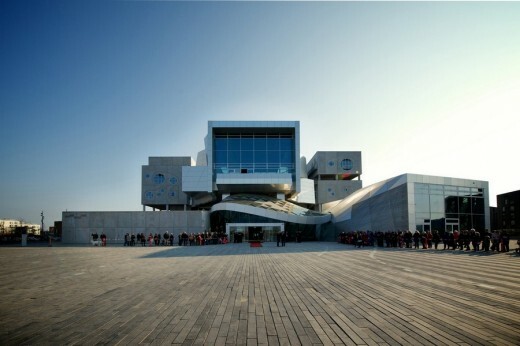 U-shaped rehearsal and training rooms are arranged around the core of the ensemble, a concert hall for about 1,300 visitors. A generous foyer connects these spaces and opens out with a multi-storey window area onto an adjacent cultural space and a fjord. Under the foyer, three more rooms of various sizes complement the space: the intimate hall, the rhythmic hall, and the classic hall. 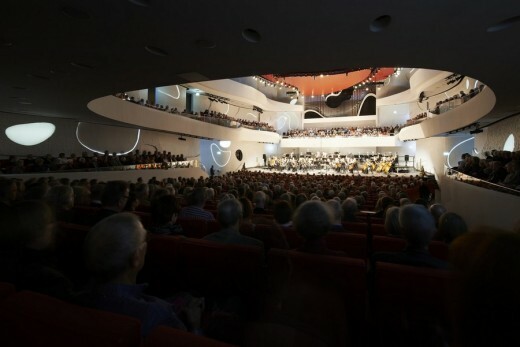 Through multiple observation windows, students and visitors can look into the concert hall from the foyer and the practice rooms and experience the musical events, including concerts and rehearsals. The flowing shapes and curves of the auditorium inside stand in contrast to the strict, cubic outer shape. The seats in the orchestra and curved balconies are arranged in such a way that offers the best possible acoustics and views of the stage. The highly complex acoustic concept was developed in collaboration with Tateo Nakajima at Arup. The design of the amorphous plaster structures on the walls and the height-adjustable ceiling suspensions, based on the exact calculations of the specialist in acoustics, ensures for the optimal listening experience. The concert hall will be one of the quietest spaces for symphonic music in Europe, with a noise-level reduction of NR10 (GK10). 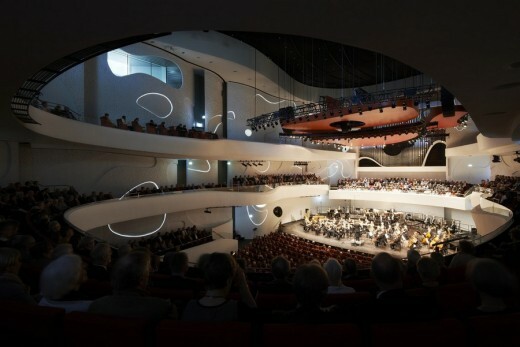 Thanks to its architectural and acoustic quality, the concert hall is already well-booked: there will be concerts featuring the Royal Philharmonic Orchestra with violin soloist Arabella Steinbacher and the Danish National Radio Orchestra with soprano Mojca Erdmann in April. The foyer serves as a meeting place for students, artists, teachers, and visitors. 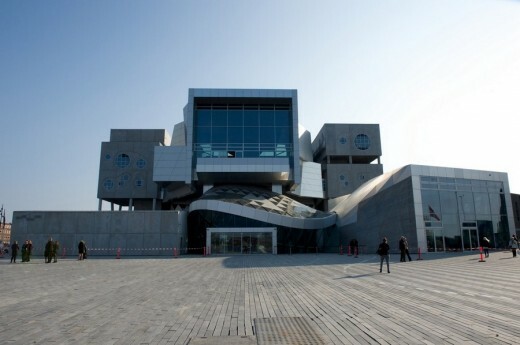 Five stories high with stairs, observation balconies, and large windows with views of the fjord, it is a lively, dynamic space that can be used for a wide variety of activities. Instead of fans, the foyer uses the natural thermal buoyancy in the large vertical space for ventilation. Water-filled hypocaust pipes in the concrete floor slab are used for cooling in summer and heating in winter. 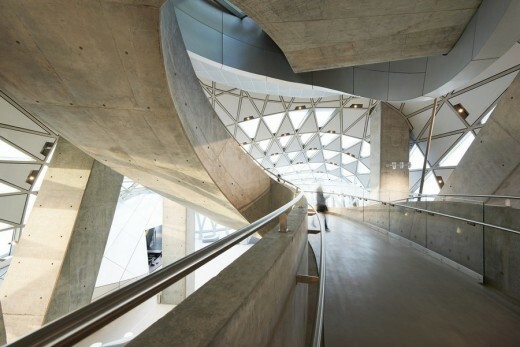 The concrete walls around the concert hall act as an additional storage capacity for thermal energy. The fjord is also used for cost-free cooling. The piping and air vents are equipped with highly efficient rotating heat exchangers. Very efficient ventilation systems with low air velocities are attached under the seats in the concert hall. Air is extracted through a ceiling grid above the lighting system so that any heat produced does not cause a rise in the temperature in the room. The building is equipped with a building management program that controls the equipment in the building and ensures that no system is active when there is no need for it. In this way, energy consumption is minimized.